The Tower of Babel: Did It Exist, and What Does the Story Mean? | Is That in the Bible? And in case you were wondering (as I was), the English word “babble” is not derived from Babel. Its roots can be traced through Old English bæblian and the Germanic languages all the way back to Proto-Indo-European. Their similarity is a happy coincidence. Let’s start with the barebones text of the story. The following is taken from the wonderful translation by the recently departed Edwin M. Good in Genesis 1–11: Tales of the Earliest World. Good has endeavoured to capture the meaning of the Hebrew without any theological preconceptions or reliance on previous English translations. The whole Earth had one language and few words. And it happened, as they were wandering in the east, and they found a valley in the land of Shin‘ar, and they settled there. And they said to one another, “Come on, let’s make bricks and burn them hard.” And they had bricks for stone and pitch served them as mortar. And they said, “Come on, let’s build ourselves a city and a tower with its top in Sky, and let’s make a name for ourselves, lest we be scattered all over Earth.” And Yahweh came down to see the city and the tower which the humans had built. And Yahweh said, “Look, it’s one people and they all have one language, and this is only the beginning of what they will do. And now nothing they intend to do will be impossible for them. Come on, let’s go down and ‘confuse’ their language there, so that no one will be able to understand what another says.” And Yahweh scattered them from there all across Earth, and they stopped building the city. 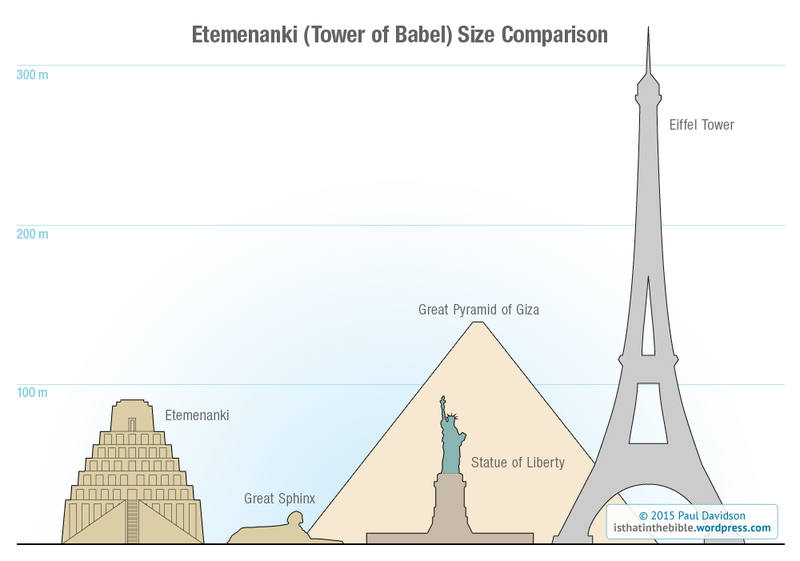 Therefore its name is called Babel, because there Yahweh ‘confused’ the language of the whole Earth. And Yahweh scattered them from there all across Earth. The story stands very well on its own without dependence on the narrative that comes before or after. The feel that one is reading a work of pure mythology is quite strong. It is a story of the First People and the First City, not set in any specific historical period and not based on any historical reality. It exists in its own mythic world like the story of Cain, who is supposedly one of only three people alive yet finds a wife and founds a city. The whole Earth had one language and few words. The story starts by telling us the whole world had one language, and that “they were wandering in the east” (or “from the east”—the grammar is unclear). Who are they? All the people of the world, it would seem. This is fine until we put the story in its larger context. Just prior to the Babel story is the Table of Nations in chapter 10, which describes how the descendants of Noah branched out to become the seventy nations of the world, all with their own languages! And then chapter 11 suddenly resets everything and we’re dealing with the ancestral tribe of all humankind, who settle in the land of Shinar (Babylon). These stories are quite unreconcilable, and it is striking that the compiler of Genesis had no qualms about putting them side-by-side. They are not connected by narrative or chronology, but by topic. What many people also fail to notice, it seems to me, is that this story establishes Babylon as the cradle of all humanity, including the Israelites. I’ll come back to this idea later. Who doesn’t appear in this story? Nimrod, the mighty hero who founds Babel and several other cities in Genesis 10, is not mentioned here — nor any king, for that matter. Later Jewish and Christian interpreters (beginning with Philo and Josephus) made Nimrod out to be the main villain of the Tower of Babel story, but that’s not in the text. First, the people decide to make some bricks. Once they have the bricks, they decide to build a city and a tower. This is a rather odd order to do things in! You would expect them to plan the city first, and then to make the bricks. One literary parallel that might explain it is the Babylonian creation epic Enuma Elish, which describes the building of the ziggurat Apsu by the gods in that order. Their purpose for building the city and the tower is twofold: to become famous, and to avoid being scattered. It’s not clear what fame would entail in a world where no one else exists. The conjunction lest is also a puzzle. How does becoming famous prevent the people from scattering? That aside, we must note that the people haven’t done anything wrong, despite the way the story is often interpreted. There is nothing intrinsically evil about fame or wanting to live in a city – indeed, fame is a positive reward promised by Yahweh to others in the Bible, notably Abraham in a passage not much further along. Those who wish to see a nefarious scheme behind the building of the city and its tower must work hard to import new meaning that isn’t obvious from the text itself. And Yahweh came down to see the city and the tower which the humans had built. Yahweh, not unlike many deities in the ancient Near East, appears as a curious god who must be on-scene if he wishes to be informed about human activities. A similar situation occurs in the narrative of the Garden of Eden when Yahweh seems unclear as to the whereabouts of Adam and Eve (Gen 3:9) or in the account of Cain and Able [sic] as Yahweh enquires of Cain as to his brother’s location (Gen 4:9). It is possible to see here an image of a deity who is not in complete control of the human situation. Yahweh also uses the first-person plural pronoun and discusses his observations with others (fellow gods, one could assume) as in the Eden story. Yahweh doesn’t like what he sees, but it’s not the people’s hubris that vexes him (as some think), nor is he personally threatened by the city and its tower. His reason is more interesting than that: the people are too competent. Humanity has one language, and this city is just the beginning of the things they will accomplish. It is strikingly similar to the Eden story, in which Adam’s acquisition of knowledge prompts Yahweh to complain that “he has become like one of us, knowing good and evil” (Gen 3:22), and must be banished from the garden lest he become immortal as well. Yahweh’s solution to humankind’s city-building endeavours is also somewhat odd. Speaking to his divine companions, he proposes that they confuse the language of the people so they cannot understand each other. But what Yahweh actually does upon descending is to scatter the people all across the earth by some means. Are the language confusion and dispersal two separate actions? Does Yahweh think that linguistic confusion alone would be unreliable? At any rate, the plan works, and the story becomes an aetiology for how different nations and languages came about. We also have some wordplay here. The name of the city is given as Babel, because there Yahweh “confused” (Hebrew balel) the language of all the earth. Clever folk etymologies are common throughout the Old Testament and obviously not literally true. Babel (the Hebrew name for Babylon) comes from Akkadian Babilu, meaning “gate of the god” — a reference to the chief Babylonian deity Marduk (Bel). The existence of the tower and its similarities to the biblical story were confirmed by later archaeological finds. No one knows exactly when it was first built, but the earliest reference to it comes from the Erra Epic, dated to 765 BCE. Nabopolassar (658–605 BCE) started restoration work on the tower after founding the Neo-Babylonian empire, and Nebuchadnezzar II (605-562) undertook a major construction project to make Etemenanki the most magnificent structure in the empire. It’s not known for certain what happened to Etemenanki. Current scholarship suggests that the Persian king Xerxes I (485–465) had the staircase destroyed due to uprisings by Babylonian usurpers. (Without the staircase, the tower could not serve as a defensive fortress.) It gradually fell into ruin until the site was cleared by Alexander the Great, who intended to rebuild it. Several cylinder inscriptions by Nebuchadnezzar II that were originally embedded in the tower’s foundation have been recovered by archaeologists. These describe the marshalling of multiethnic armies of corvée labour, the baking and glazing of bricks, and the import of bitumen (pitch). It is interesting that they focus on some of the same physical details the biblical story does. Nebuchadnezzar, King of Babylon am I. In order to complete E-temen-anki and E-ur-me-imin-anki, I mobilized all countries everywhere, each and every ruler who had been raised to prominence over all the people of the world…The base I filled in to make a high terrace. I built their structures with bitumen and baked brick throughout. I completed it, raising its top to the Heaven, making it gleam bright as the sun. Again, the use of baked bricks and bitumen and the hyperbole about its top reaching heaven are details repeated in Genesis 11. 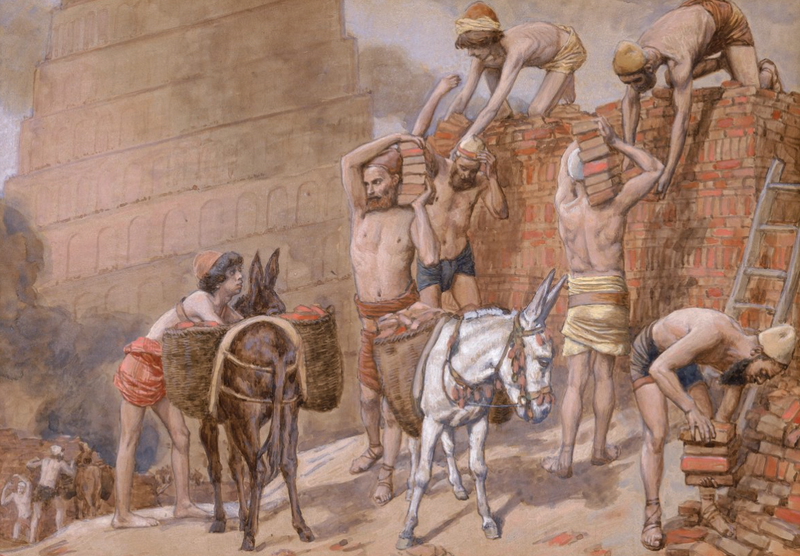 Many scholars thus date some version of the biblical tale to the 6th or 5th century BCE, when many Jews lived in Babylon and may have even been employed in building the tower. …The Berossan account of the city of Babylon is unique among Classical Era authors in one important respect, namely, the great antiquity of the city. …the city of Babylon was said to have only been founded under Semiramis according to all sources other than Berossus. Berossus claimed that Bel-Marduk constructed the city of Babylon (and the temple of Bel) at the time of earth’s creation, following Enuma Elish. Bel (Marduk) the creator god together with the first people constructed the wall of Babylon, its temple complex, and its temple-tower (Etemenanki). Under Bel’s rule, the people were monolingual and united in one city. The god Nabu, who invented writing, taught the people various languages — apparently out of jealousy toward Bel — and this resulted in conflict. Many scholars draw a dividing line between the Primeval History and the rest of Genesis, but I’m not so sure that is necessary. If we look at the material topically, the Tower of Babel story is followed by Abram’s genealogy and then a collection of folktales about Abram (Abraham). Where is Abram, father of all the Israelites, from in the Genesis tradition? From Babylonia — Ur of the Chaldeans, to be exact, named for the Chaldean dynasty that rose to power in Babylonia around 600 BCE. Surely, it is topically relevant that two stories presented back-to-back both place Israel’s origins in Babylonia. In the Genesis story, Abram moves from Ur to Haran, and then to Canaan, to claim the Promised Land on behalf of all Israel. These places are not random names drawn from a hat to give Abram a plausible-sounding backstory. Furthermore, Abram’s father is named Terah, which seems to have been a city in Aram (Syria), and both Haran and Nahor (Abram’s brothers) double as place names from that region. Abram’s family tree is geographical in function. What is the significance of these names? A common argument (put forward by Good, for example, on p. 112) to explain Abram’s starting-point in Ur is that the text is calling on the post-exilic Jews in Babylon to follow in Abram’s footsteps and return to Palestine. Garbini (1986), whose ideas are always fascinating, notes that these names place Abram territorially and chronologically in Mesopotamia at the time of Nabonidus — the last Neo-Babylonian king, and a “fervent adherent of the cult of the moon god Sin” whose most important sanctuaries were in Ur and Haran, and whose mixed ethnic background was Aramean and Chaldean (“Nabonidus”, ABD). Garbini argues that placing references to Nabonidus and his politics in the Abram narrative were a way for the Judean exiles to establish a native claim to their new country and create a link with the king under whom they flourished. Nabonidus is portrayed favourably in other Jewish works, notably the Prayer of Nabonidus found at Qumran (and on which the story of Nebuchadnezzar’s madness in Daniel seems to be based). Similarly, many of the oracles of Ezekiel, written a bit earlier during the exile, explicitly support the political efforts of Nebuchadnezzar and condemn his opponents in Tyre and Egypt, while Second Isaiah promotes the ideology of the Persian kings it was written under. My (admittedly speculative) suggestion, then, is that the Tower of Babel story could function in a similar manner, affirming an ancient Babylonian pedigree for the Jews while gently mocking the great city and its ziggurat — particularly since Nabonidus and the Persian rulers who followed him were opposed to the Marduk cult in Babylon and ultimately destroyed the tower. One of the theological difficulties with the Primeval History in Genesis is that if the stories are understood literally, then they make testable scientific claims about the past. And boy do they fail those tests. It is important to emphasize that few theologians interpret Genesis literally these days. The biggest Christian denominations worldwide embrace science — particularly the Catholic church. However, fundamentalist Evangelical Christianity is another matter. Fierce debate is waged in church pews and religious colleges (particularly in the United States) between science and various flavours of creationism. A literal reading of the opening chapters of Genesis is non-negotiable for many Christians; without it, elaborate doctrines of Original Sin and atonement honed by Medieval theologians would collapse. But if the universe, humans, plants and animals were created in their present forms over a six-day period on or about the year 4,000 BC (a date arrived at through biblical genealogies), then everything science has discovered about biology, evolution, astronomy, and geology is wrong despite all appearances to the contrary. For many, the story of Noah’s Flood is also non-negotiable as a historical event. It has led to a field of pseudo-science called “flood geology” — the invention of Seventh Day Adventist George McCready Price. (And it should be noted that modern young-earth creationism is in large part due to the teachings of Adventist founder Ellen White.) Noah’s flood has become the go-to explanation for dismissing the most obvious geological difficulties with creationism — the geological column, dinosaur fossils, erosion canyons, and so on. Babel linguistics, in fact, has quite an old pedigree. The earliest European scholars to theorize about languages during the Middle Ages and the Renaissance assumed that all languages had come from Babylon. Typically, it was held that Hebrew as the “language of God” must have been the pure, uncorrupted Adamic language spoken before Babel. Such views were still commonplace in the 16th century when serious linguistic studies began to be published, but were increasingly abandoned as knowledge grew. After dispensing with Babel, linguists attempted to classify languages in terms of Noah’s descendants — describing them as Semitic from Shem, Hamitic from Ham, or Japhetic from Japheth. By around the 18th century though, even this was abandoned, as linguists developed better tools for comparing languages and tracing their ancestry. Edwin M. Good, Genesis 1–11: Tales of the Earliest World. Theodore Hiebert, “The Tower of Babel”, Journal of Biblical Literature 126.1, Spring 2007. Phillip Michael Sherman, Babel’s Tower Translated: Genesis 11 and Ancient Jewish Interpretation (BI 117). Russell E. Gmirkin, Berossus and Genesis, Manetho and Exodus: Hellenistic Histories and the Date of the Pentateuch (LHB/OTS 433). P. Schnabel, Berossus und die babylonisch-hellenistische Literatur. GIovanni Garbini, History and Ideology in Ancient Israel. Excellent treatment of the chapter. I came to similar conclusions in a (much shorter) post on my own blog; I appreciate how in-depth you went here. Great post! The story does seem to imply that YHWH was opposed to human progress doesn’t it? But I guess that would comport with the Fundamentalist view of the value of human research and learning. Thanks for the comment, Lonnie. Yeah, it’s interesting that humans, first with Adam and then with Babel, have to be restrained from obtaining knowledge and abilities that rival God’s. Very Promethean. It also reminds me of the SF novel “Lord of Light”, in which elite humans with ultra-advanced life-prolonging technology pose as Hindu gods and wipe out human civilization every few thousand years — whenever the flush-toilet gets invented. Thanks Paul, I found this post fascinating. I had not even noticed before the conflict between Genesis 11 and 10. Reblogged this on İncil Nasıl Tahrif Edildi?. And Yahweh came down to see the city and the tower which the humans had built. And Yahweh said, “Look, it’s one people and they all have one language, and this is only the beginning of what they will do. And now nothing they intend to do will be impossible for them. Come on, let’s go down and ‘confuse’ their language there, so that no one will be able to understand what another says.” And Yahweh scattered them from there all across Earth, and they stopped building the city. How could the people stop building a city which a previous verse says was already built? The Hebrew word used in verse 5 expresses a completed action. You can view the interlinear: http://biblehub.com/interlinear/genesis/11-5.htm. 11:5 is also a verse you can add to your NIV-mistranslations page, because that “translation” renders the Hebrew “were building,” obviously to avoid conflict with verse 8. Good observation, John. You’re probably right about the NIV’s choice of verb tenses. I guess you could argue that even when a city is “built”, it’s never finished, but there is some ambiguity in the story as to whether scattering the people interrupted their plans mid-progress or not.